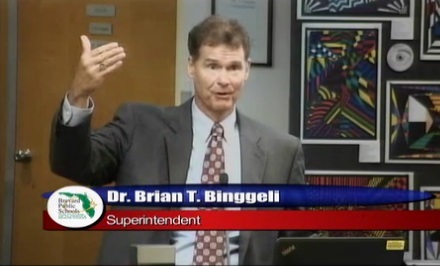 BREVARD COUNTY, Florida - At the Brevard County Public School Board Workshop Meeting on June 23, 2015, outgoing Brevard County School Superintendent Brian Binggeli announced to School Board members that they will have $10.5 million in new money to spend at their discretion in the upcoming fiscal year, according to preliminary budget figures. 4. 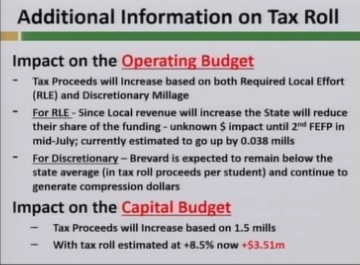 A shift of $4 million in property insurance payments from Brevard Public School's operating budget to the capital budget which was made possible by the Brevard County Public Schools' half-cent sales tax passed by voters last year that is expected to generate around $8.5 million. 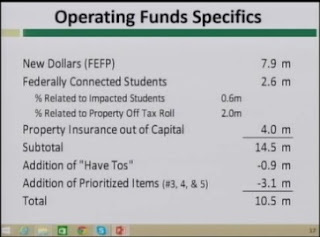 "That really brings us to $14.5 million if you add those three items up. 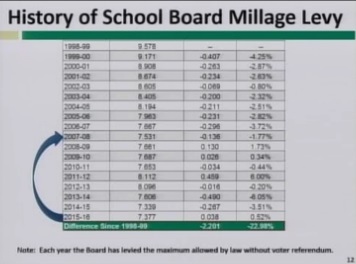 That really are, at your discretion," Bingelli told the Board during his presentation. "If you recall, I gave the board a hard copy of documents that we had worked through in previous workshops. 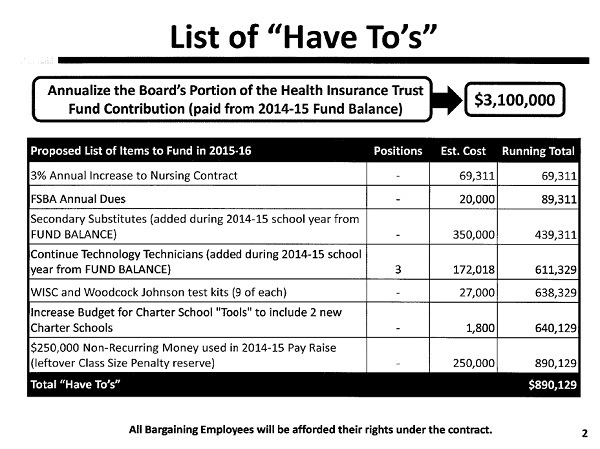 There was about $900,000 that was in that "have to" list, some of the things that we had funded with non-recurring money and others, that by law, that had to get funded. 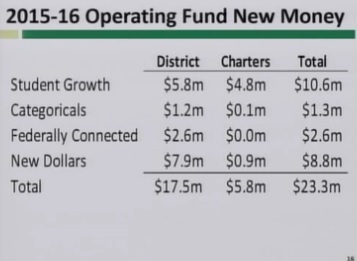 The 3, 4, and 5 that we talked about in previous workshops is right at about $3.1 million. So, as we said from the start, those two things kinda combine, the good news is that the property insurance move really, for the most part, covers those items. 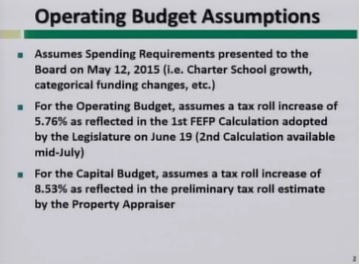 So what that really leaves is for the Board to not only have new FEFP dollars, but also that new supplement, which really will be, at your discretion. That, as you know, will be done in a forum outside of this one. But I just wanted to make sure everyone knew that's where we are at this point. That is certainly a much better picture than we've seen in the past." "I know you say this is Board discretion, and certainly it is. Originally, the intent was to have as capital dollars, right?" asked Brevard County School Board Member, John Craig. "... Since it was originally, at least from our perspective, meaning Brevard County, and from your leadership, intended to be more of a capital solution... I want to know whether or not you are planning on keeping some of it for capital? Are there capital things that you have set aside that that is what you are going to use that money for?" "The answer is, if you recall the capital plan that I provided for you, this was one of those items, if you remember the checklist that said the plan is intact using the funding as it relates to impact fees and capital reserve and so forth," replied Bingelli. 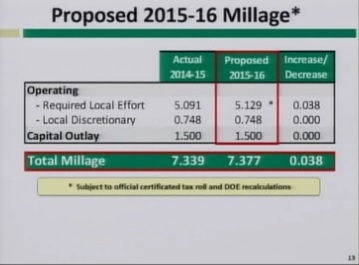 "However, there would be things that could potentially make the capital picture better. Tax roll going up more than what we said, this was one of those. So, it is not embedded in the plan that I gave you. But it was given to you as something that we did feel at the time, that there would be this potential." 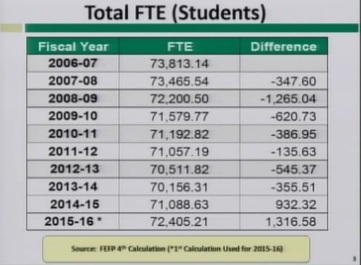 A more accurate and revised budget based on the school property tax millage changes and other revenue sources will be presented at the School Board Meeting in Viera which begins at 5:30 p.m. on July 30th.